I found this in her book here online. To me, it is very interesting and tells a lot, because it proves that Kerensky knew that the rumors about Alexandra were not true but he used them to his advantage. KERENSKY (with sinister emphasis): "Listen, Madame Dehn, you know too much. You have been constantly with the Empress since the beginning of the Revolution. You can, if you choose, throw quite another light on certain happenings which we have represented in a different aspect. You're DANGEROUS." So don't you think it's interesting and sad how the revolutionaries, not only Bosheviks, fed off the hatred for the Tsarina caused by rumors, when it appears they knew they were false? Which would mean that his memoirs will unlikely to see the light of day. That will be a great loss to history. Does anyone have a birth and death year on Lili, and what became of her after she left the Crimea? Did she stay in France or move to the US? When did she die and how old? Thanks for the info on her ethnic background, her name sounded German to me. Annie, Lili Dehn died in Roma in 1963. From the Crimea, she went to Constantinopl, then to England and a long time lived in Poland, where her husband died. For russian readers, a link about Julia Dehn and her daughter Mary, who is still living in the USA at the moment. Not especially serious, but some information! I did not know that Lili was the great-grand-daghter of the famous Kutuzov! I have to add that the family name Dehn is the one of her husband, from an old family of baltic origin. 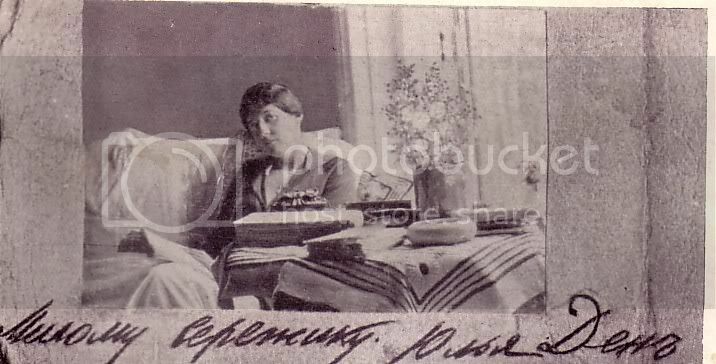 Julia Alexandrovna von Dehn=Lili Dehn (Summer 1917 Finland) née Smolsky. Her mother Catherine Leonidovna née Horvat after her divorce with Julia Alexandrovna's father married officer of cavalry Veletsky (died in 1915 during a battle). Catherine Leonidovna's mother was Marie Karlovna Horvat née Baroness Pillar von Pilhau. They all lived together with Julia's son Titi ( from French=le petit=Titi) Alexandre in Beletskovka (Ukraine) during the Revolution. According to the Russian language link provided by Matushka, the presumption in the above quote is incorrect. "No. From first sight (I) don't recognize her", - said the Tsaritsa's friend, seeing the imposter. In that, Anna Anderson is not Anastasia in any way, clearheaded Lili had no doubt (and which DNA analysis confirmed after Anderson's death), ..."
You should post this on the 'survivor' forum. AA supporters like to use her for evidence. I always thought that if she did recognize her, she was old (if it was the 1950's she was old) and maybe nostalgic or even senile. Also by that time she probably couldn't have recognized the real AN, who'd have been in her 50's, from the young girl she last saw in the spring of 1917. I never believed Lili really accepted AA, unless she had become delusional in her old age. I too would like to know if she kept in contact with AV, her best friend. AV was never asked about AA and I wonder if she ever discussed it with Lili. I don't know that Anya Vrubova was Lili's best friend. I recall passages from Lili's book which depict Anya in a decidedly unfavorable light; at times she is downright exasperated by her. However, because of their shared experiences it is not be unreasonable to think that they kept in touch in their later years. "[ch1053][ch1077][ch1090]. [ch1057] [ch1087][ch1077][ch1088][ch1074][ch1086][ch1075][ch1086] [ch1074][ch1079][ch1075][ch1083][ch1103][ch1076][ch1072] [ch1085][ch1077] [ch1091][ch1079][ch1085][ch1072][ch1102] [ch1077][ch1077]", - [ch1089][ch1082][ch1072][ch1079][ch1072][ch1083][ch1072] [ch1087][ch1086][ch1076][ch1088][ch1091][ch1075][ch1072] [ch1094][ch1072][ch1088][ch1080][ch1094][ch1099], [ch1091][ch1074][ch1080][ch1076][ch1077][ch1074] [ch1089][ch1072][ch1084][ch1086][ch1079][ch1074][ch1072][ch1085][ch1082][ch1091]. [ch1042] [ch1090][ch1086][ch1084], [ch1095][ch1090][ch1086] [ch1040][ch1085][ch1085][ch1072] [ch1040][ch1085][ch1076][ch1077][ch1088][ch1089][ch1086][ch1085] [ch1085][ch1080][ch1082][ch1086][ch1080][ch1084] [ch1086][ch1073][ch1088][ch1072][ch1079][ch1086][ch1084] [ch1085][ch1077] [ch1040][ch1085][ch1072][ch1089][ch1090][ch1072][ch1089][ch1080][ch1103], [ch1090][ch1088][ch1077][ch1079][ch1074][ch1086][ch1084][ch1099][ch1089][ch1083][ch1103][ch1097][ch1072][ch1103] [ch1051][ch1080][ch1083][ch1080] [ch1085][ch1077] [ch1089][ch1086][ch1084][ch1085][ch1077][ch1074][ch1072][ch1083][ch1072][ch1089][ch1100] ([ch1095][ch1090][ch1086] [ch1080] [ch1087][ch1086][ch1076][ch1090][ch1074][ch1077][ch1088][ch1076][ch1080][ch1083] [ch1087][ch1086][ch1089][ch1083][ch1077] [ch1089][ch1084][ch1077][ch1088][ch1090][ch1080] [ch1040][ch1085][ch1076][ch1077][ch1088][ch1089][ch1086][ch1085] [ch1072][ch1085][ch1072][ch1083][ch1080][ch1079] [ch1044][ch1053][ch1050]), ..."
Yes; she wrote it. She didn't recognized her at the first sight, but the quote is not complete. Lili saw AA in 1949, so you may imagine that her face was not the same of a young girl having 16 years old. If she was AN, she had 48, if not, she was much older. What can I saiy after having known her? I certainly cannot be mistaken about her identity..."
You are right. DNA said that AA was not Anastasia (I always repeat it for I don't want you accuse me of trying to fool people). But you are not right about Lili Denh's opinion on the matter. It is clear that during the time period mentioned, Lili Dehn did indeed believe that AA was Anastasia Nicholievna. I believe an earlier poster's contention was that Lili did not believe this later on. However, I have seen no evidence of this myself.